If you plan to bedshare with your baby you will need to make an informed decision about the risks and benefits based on your own individual situation. A baby's risk when bedsharing varies according to his age and whether or not he is breastfed, combined with factors such as the bed environment and whether either parent smokes or has taken anything that reduces their ability to respond to their baby. These risks will differ for each family situation. 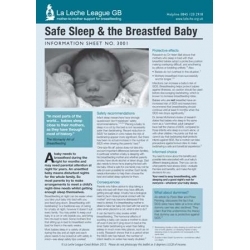 This information sheet explains how you can reduce risks and help everyone get the sleep they need. Page 2 provides details suggestions for making a baby's sleeping place safer, wherever he sleeps.